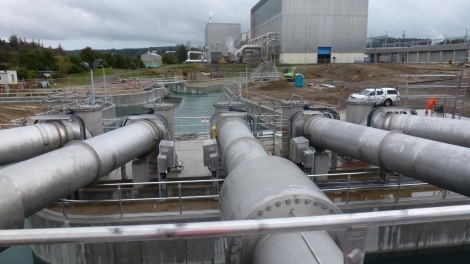 Bio-Reactor, which uses sulphur oxidising bacteria to remove up to 80 per cent of the hydrogen sulphide. PFS Engineering fabricated and installed the pump tubes and delivery pipes (1200mm dia SS). Pump tubes incorporated an innovative "lobster-back tee" design that allowed clear access for maintenance pumps, meanwhile presenting the fluid a clear flow path through a lobster back elbow. PFS also fabricated and installed the stainless steel vacuum priming system for the plant.